Notepad Corner: Varicose Vein Treatment: Does Inflammation Cause Varicose Veins? Varicose Vein Treatment: Does Inflammation Cause Varicose Veins? In medical science, cause and effect can sometimes be difficult to sort out. For example, medical researchers and vein doctors know there is a strong association between inflammation and chronic venous disease (varicose veins). However, by the time doctors see patients to evaluate them for varicose vein treatment, they usually already have both varicose veins (sometimes hidden) and inflammation. Since the association already exists, it's hard to know which came first. Did the inflammation cause the varicose vein disease or did the varicose vein disease bring on the inflammation? It's important to know which comes first, inflammation or varicose vein disease, in order to proceed with certain types of varicose vein treatment. 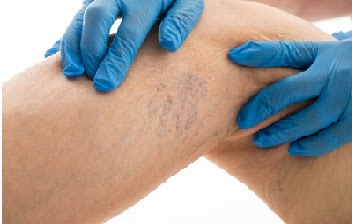 If inflammation is causing the disease, it may be best to first treat the inflammation to slow the progression of the disease and to get a clearer picture of which varicose veins need to be treated first, second, and third. It may be that a vein doctor would want to do a separate duplex ultrasound test before and after the inflammation is brought under control to see if there are any changes in the structure of the vein walls and in the venous reflux (blood flowing backwards in the veins) after the inflammation is cleared up. There's also a third possibility with regards to a correlation between the presence of varicose veins and inflammation. It could be that inflammation does not directly cause the initiation of varicose vein disease but plays a role in exacerbating the condition once it has started. If this is true, it would still be therapeutic to the varicose vein disease to treat the inflammation, perhaps even before other procedures like laser varicose vein treatment or sclerotherapy are performed. An intriguing paper was published recently (February 2018) by researchers at the University of Pittsburgh, School of Medicine, Division of Vascular Surgery. The paper was entitled, "Suppressed Networks of Inflammatory Mediators Characterize Chronic Venous Insufficiency," and was published in the Journal of Vascular Surgery: Venous and Lymphatic Disorders. This is one of the premiere journals for research related to varicose vein treatment and other closely related chronic venous insufficiency (CVI) issues so the best research in the field tends to get published in this prestigious peer reviewed journal. This important paper would be a bit technical for the average person seeking varicose vein treatment evaluation so here is a synopsis of the most important points. The researchers compared the "inflammatory mediators" circulating in the blood of people who had no signs of varicose vein disease to those who had early to mid stage varicose vein disease. In the patients with the disease, they were still early enough in the disease stage to be considered "benign," meaning they did not experience significant physical symptoms, i.e. symptoms that lowered the quality of life, but duplex ultrasound clearly showed signs of varicose vein disease. Inflammatory mediators are chemicals in the blood that are known to be associated with a response to inflammation, thus they indicate the presence of inflammation. The results of the study were highly significant. Four major interconnected inflammatory mediators were found in much higher amounts in patients who had early stage varicose vein disease versus those who had no signs of varicose vein disease. The results seem to suggest that inflammation may cause varicose vein disease, or at least exacerbate it, by not allowing structural damage of vein walls and vein valves to ever heal properly in the earliest stages of varicose vein disease. The researchers indicate in this paper that larger scale studies, similar in design to what they did, need to be done to further address the cause and effect relationship between inflammation and varicose vein disease. However, this research already suggests that treating inflammation early on could, at minimum, help slow down the progression of the disease. Further, reducing inflammation may even be effective in preventing varicose vein disease altogether! If you seek the help of a vein doctor, he or she may very well put you on a prescription based anti-inflammatory pharmaceutical. Alternately, your doctor may simply suggest an over the counter anti-inflammatory medication you can take. At the same time, you can also try preventing inflammation with natural remedies. Vitamin D and omega-3 have both been shown in recent research to reduce inflammation and strengthen the immune system and most Americans are critically low on both. Therefore, taking these anti-inflammatory supplements may help. You can also try cutting back on sugar and carbonated drinks which both tend to cause inflammation in the body. The best way to know if you need varicose vein treatment, and perhaps treatment for inflammation of your veins, is to seek a professional evaluation at a varicose vein treatment specialty clinic like Metro Vein Centers. Visual inspection, a detailed interview, and most importantly, a duplex ultrasound test, conducted by experts, will let you know for sure where you stand. You can get a free evaluation by Metro Vein Centers just by giving them a call and setting up an appointment. You do not need to get a referral from your family physician or from your insurance company for this free evaluation.